lots and lots of reflection. awww…I hope you find your vibrant energy again soon. Lately I feel like I’m on this planet alone, navigating some bizarre world called motherhood. A tiny bit of beauty sits just above. What a stunning image this is; if this is what you produce when you are feeling faded, what magic may we expect when you are once again in full bloom? The changing of the seasons sparkes a new engergy in me. Hoping that beauty comes into full view and that you no longer have to lurk in the shadows to see it. I’ve feeling a little frayed around the edges – ready for some vacation time. 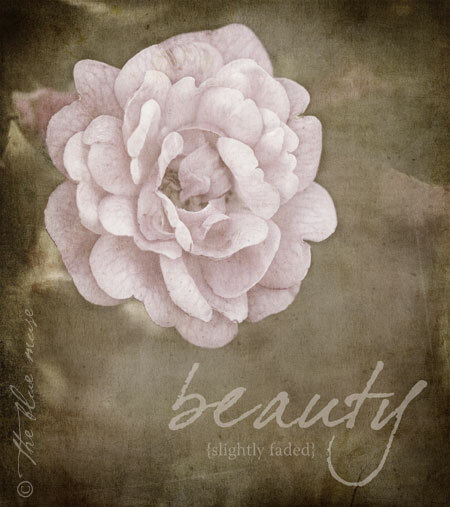 Oh yes, faded describes it well but thankfully, beauty is always there even if it’s tucked and hidden away…and it’s so encouraging to know that! Such a beautiful image. How interesting – very similar to how I currently feel. It is the change of the season? I love beauty lurking. Any ol’ where!! Kelly, it’s a Saturday morning where I am. The air is crisp and the farmers’ market will soon open. The fresh baked pastries, scent of lilies and eucalyptus, and the feeling of renewal in the fall bring me back to a place of calm and beauty. And here at this place you have created there is much beauty. Thinking of you and wishing you peace and joy. The feeling of fading may be the moment right before the renewal and flourishing of creativity, much like the sun setting before it rises. I’m feeling pulled at both ends and don’t know which end (or will it be the middle?) gets pulled apart first. But I love what you wrote, because it makes me feel less alone in this! is it the fading light of autumn in which all things look beautiful? yes, we must always look for the beauty in things. well said, here. It’s all about finding the beauty in those shadows. Transitions – seasonal..or otherwise – can be a little overwhelming!!! exactly what i have been thinking myself..keep finding the beauty. it lifts and sustains. xo and love to you!